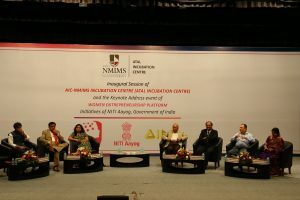 NMIMS recently established the Atal Incubation Centre in its campus with the support of Atal Innovation Mission, NITI Aayog, Government of India. 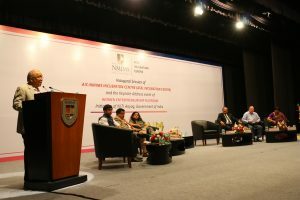 The event was held at 2:00 pm, July 13, 2018 at Mukesh R Patel Auditorium. Dr. Rajan Saxena, Vice Chancellor, NMIMS welcomed the gathering of entrepreneurs, startups, faculty and students of NMIMS and SVKM Institutes. 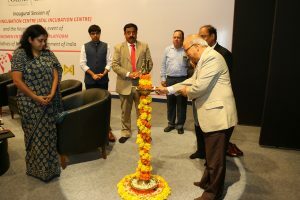 This was followed by Inaugural ceremony of AIC-NMIMS Incubation Centre with the Chief Guests and management team of NMIMS team. Later Mr. R.Ramanan than Mission Director, Atal Innovation Mission, NITI Aayog addressed the audience and shared some examples of innovations from women entrepreneurs in the country. Mr. Harshal Shah, CEO, AIC-NMIMS Incubation Centre shared some interesting anecdotes from his entrepreneurial days and urged the student community to express their ideas and pursue their entrepreneurial dreams. 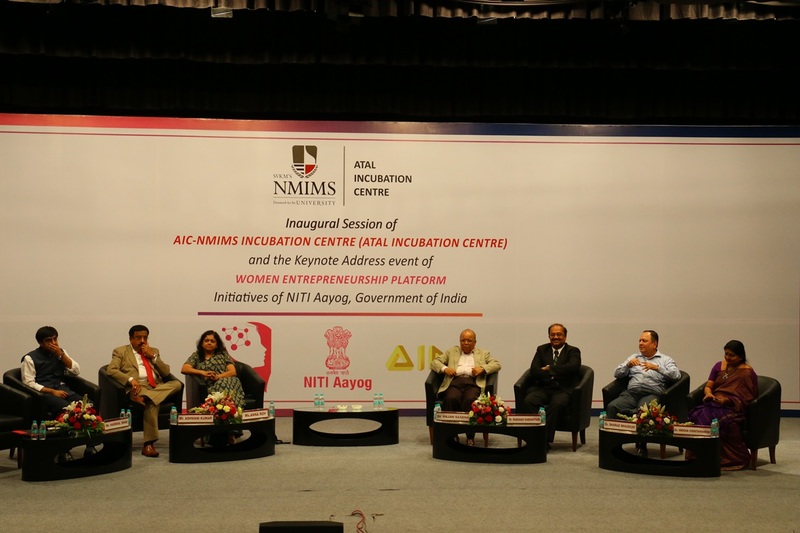 He welcomed all women and student entrepreneurs to apply to AIC-NMIMS of the first cohort of its Incubation Program. 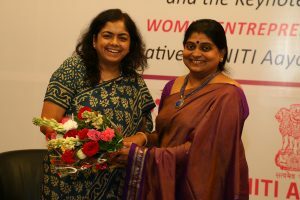 Ms. Anna Roy, Adviser and Industry Expert heading the WEP at NITI Aayog briefed the purpose and mandate of the Women Entrepreneurship Platform. She gave several examples and case studies of how the scheme had benefited women entrepreneurs in the country. Mr. Ashwani Kumar, Head, WEP Finance Vertical also joined the panel along with Mr. Ramanan and Ms. Anna Roy. Each panelist shared a lot of insight and their experience and views about the Women empowerment at work and in Industry. The panel Discussion was then followed by Q and A session. Vote of thanks was delivered by Dr Roshan Yedery, Manager, AIC-NMIMS Incubation Centre.